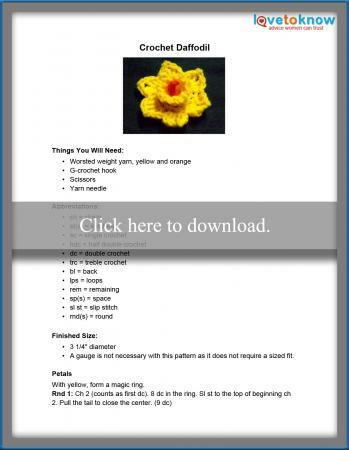 Whether it is spring or Christmas time, these crochet flower patterns are the perfect embellishment for the season. Add a finishing touch to fashion accessories, create crochet bouquets, or make holiday decorations. Each pattern uses basic crochet stitches, are quick to crochet, and are suitable for a beginner. 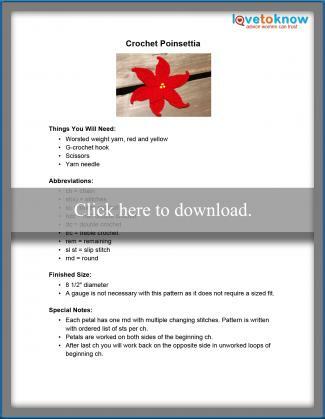 Download and print the pattern instructions for each project by clicking on the pattern images. If you need additional help with downloading the printables, try the tips in the Guide for Adobe Printables. This poinsettia is realistic in size and is made with two layers. If a smaller flower is desired, omit the large bottom petals. Decorate your Easter table with a beautiful spring bouquet of crochet daffodils. You can complete each daffodil in less than 20 minutes. 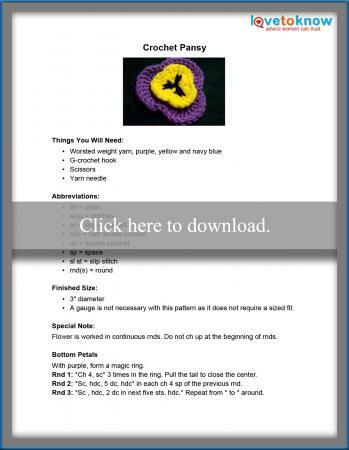 This crochet pansy is flat enough to be an applique, but you can also manipulate it to give it dimension in a bouquet. Make one or a dozen as desired. Whether you just want to try your hand at crocheting flowers or have a particular project in mind, specifics of these flower patterns do not have to limit your creativity. There are numerous ways to alter and customize these flowers to fit your vision. Don't restrict yourself to the colors used in these patterns. Crochet flowers are the perfect projects to use up those small bits of yarn from your scrap basket. There are two basic methods for reducing or enlarging the size of each flower. Simply use a smaller or larger crochet hook, or use thinner or thicker yarn. Create bouquets by recycling old silk flowers. Remove the silk flower heads from the stems, add a dab of glue to the stem end and insert into the center-back of your crochet blooms. Add a fancy finishing touch to your flowers with sequins, buttons or beads. Add hangers to your flowers to use as ornaments, or string them on a cord to use as garland. To help shape the petals on the poinsettia or other large flowers, weave craft wire through the stitches on the back of the petals. Many crafters crochet as a way to relax. Even if you have no idea how you will use your finished posies, crocheting flowers is a great way to ease the tension of a hectic day. Keep a basket of yarn near your favorite easy chair whenever the need arises.